Along the narrow streets of Bangkok’s Old City, or Banglamphu, families have been perfecting their recipes for generations. The result is some of the most unforgettable food in the kingdom, prepared with heart, but often disguised behind nondescript shophouses and markets tucked into mazes of alleyways. In this historic area, Bangkok’s rich and compelling heritage is expressed in every bite. 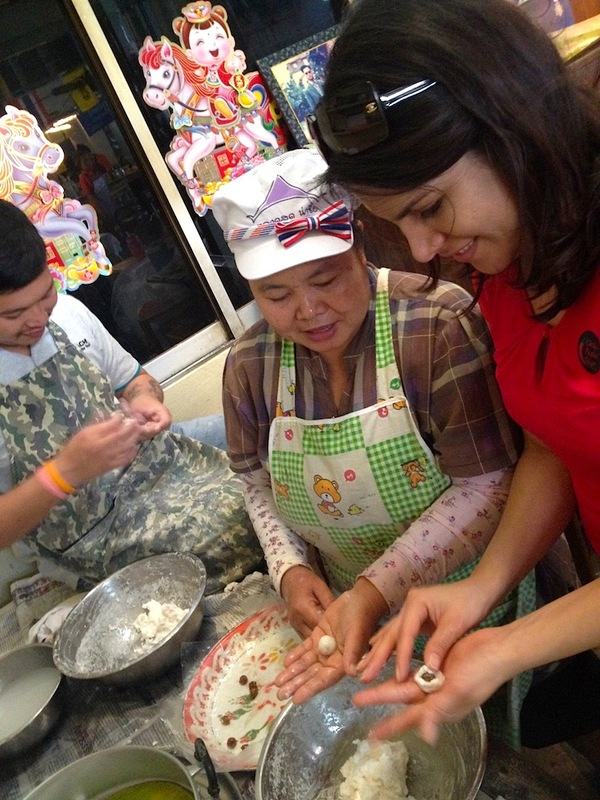 As our most food-focused tour, the Old Bangkok Food & Culture Walk is a great choice for dedicated foodies looking to explore the historic district through their taste buds. Click here for photos of this tour. 9:00: Meet at Krung Thonburi BTS SkyTrain Station, Exit 3, and take local transport to Bangkok’s old quarter. 9:15 – 11:45: Sample Thai-style breakfast food in an alleyway market lined by century-old shophouses, try a bunch of different foods, meet some of the vendors and, if it’s open, pop into an 80-year-old Thai herb shop to explore this ancient form of medicine. 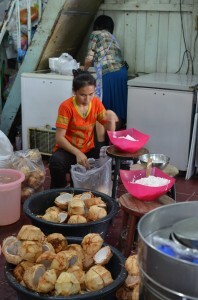 11:45 – 13:00: Go deeper into the Old Town, stopping to see gorgeous old houses and stop for coffee and Thai snacks. Along the way you’ll pass smoky Chinese shrines and Buddha images sitting on the footpaths. 13:00 – 14:00: Enjoy central Thai curries, salads and soups prepared by an experienced chef who cuts no corners, crafting every dish, including the curry pastes, by hand, to order. 14:00 – 14:30: Cool off with mango, coconut and/or durian ice cream at a shop that’s been hand-producing ice cream from young coconuts for over 70 years. In this area, you’re also welcome to browse shops selling Thai uniforms, musical instruments, and arts and crafts from throughout Thailand. 14:30 – 15:30: Finish with a stroll through Pak Khlong Talad, one of the world’s largest cut flower markets. *These times are estimates, and we don’t normally stick to a rigid schedule. Depending on the customer’s preferences, this tour can finish anywhere between 14:00 and 17:00. Normal meeting is 9:00 AM at Krung Thonburi BTS SkyTrain Station, Exit 2. For a map of the BTS SkyTrain and MRT Subway systems, click here. *Please let us know if you’re staying away from the SkyTrain/Subway lines (in Khao San Road or Chinatown areas, for example); in these cases it may be possible to meet at a Chao Phraya river ferry pier. 2,400 Baht per person for 2 guests. 2,200 Baht per person for 3 guests. 2,000 Baht per person for 4+ guests. 3,600 Baht for 1 person only. What is the date (or dates) that you would like to do the tour? What are the full names, ages and nationalities of every person in your group? Do you need directions for going from your hotel to the meeting point? Any eating restrictions such as food allergies, vegetarian or no pork? Any health conditions that we should be aware of?